WELCOME TO THE WORLD OF INVISIBLE PAINTING !!! Here is a 3rd painting on a large ( 4ft by 6ft.) flannel throw blanket. Again I used this picture as an illustration on my lecture about the EAGELS. Again I over painted it with florescent paint (blue ) , florescent brown ( available in crayons only), florescent white (available in chalk only ) etc. 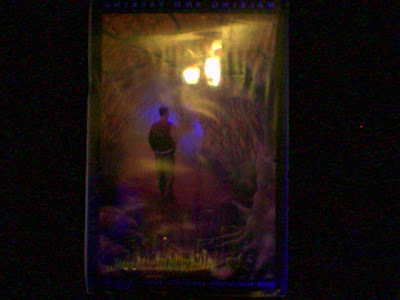 And then with the white light off, and the black light on : we have a very dramatic glow in the dark 3-D effect. WELCIOME TO THE WORLD OF INVISIBLE PAINTING !!! Here is another flannel throw blanket. 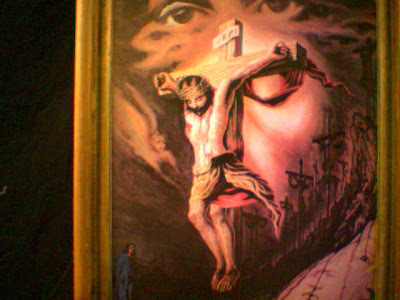 But is has a large great (4ft by 6 ft. ) painting on it. And it was only $ 10. What I am after is the painting. So I painted over it with flourescent chalk,crayons, and paint. This creates a great a dramatic black light effect. I use it for a fathers day message. 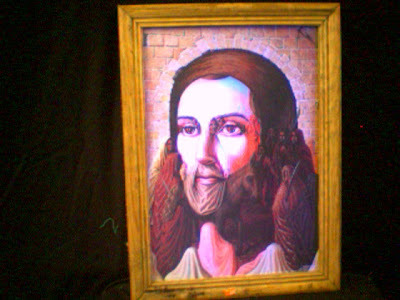 Beside this picture is a black light of Jesus with a boy. It makes a great dramatic presentation. WELCOME TO THE WORLD OF INVISIBLE PAINTING !!! Here we have a large ( 4ft. 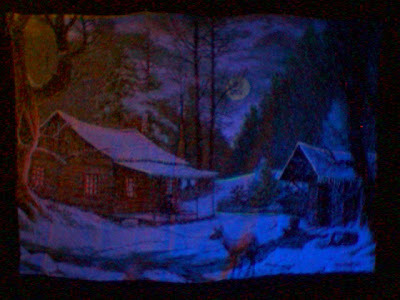 by 6 ft. ) permanent color background on a small blanket throw of flannel. WELCOME TO THE WORLD OF INVISIBLE PAINTINGS !!!! Here IS a simple chalk talk lay out. The fall season of your life. Everything is brown and yellow like THE FALL. But an invisible picture fits to the right side of the man. And when the white light is turned off and the black light is turned on . :THE FALL CHANGES TO SPRING. and the invisible picture appears. WELCOME TO THE PICTURE OF INVISIBLE LIGHT !!! WELCOME TO THE WORLD OF INVISIBLE PAINTING !! What do you see ??? 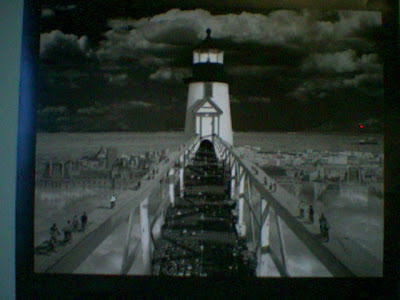 You say I see a photo of a bridge leading out to a light house ! WRONG !! LOOK AGAIN ! There are really 3 photos superimposed over each other. (1) There is the sea side city in the back ground. (2) There is the hidden (camouflaged highway bridge- leading to the light house-- made to look like a small walking bridge- camouflaged.) Ands (3) the out of sized light house set in the middle of the mix. 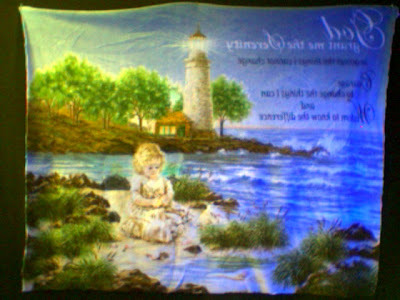 WELCOME T0 THE WORLD OF INVISIBLE PAINTING !!!! NOW HERE IS SOME THING DIFFERENT ! Here are 2 real photos of real places. But when you combine them, then you get an entirely different picture. Now I am going to take this "unreal-real photo" and blow it up to 4ft by 6ft on special florescence cloth . 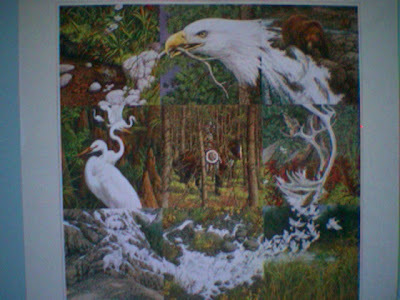 Then I am going to over paint the water fall into a lake of fire putting invisible pictures (1) in the white area at the bottom of the falls, and (2)invisible picture in the white cloud area on the left and right. 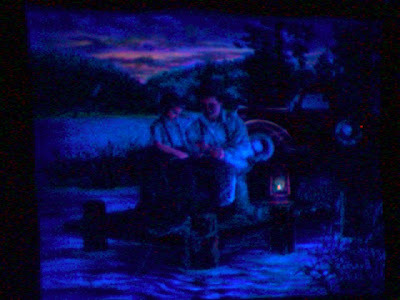 SO THAT WHEN I TURN ON THE BLACK LIGHTS I WILL HAVE A VERY DRAMATIC AND DIFFERENT PAINTING ALTOGETHER. WELCOME TO THE WORLD OF INVISIBLE PICTURES !!! WELCOME TO THE WORLD OF INVISIBLE PASINTING ! 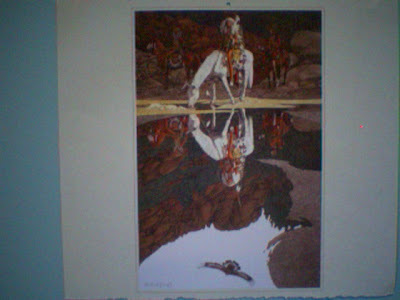 !1 HERE, we have white on white & brown on brown......the horse and the indian ridder are the invisible picture here. Some of the white is snow, and some of the white (that looks like snow but is really the horse. 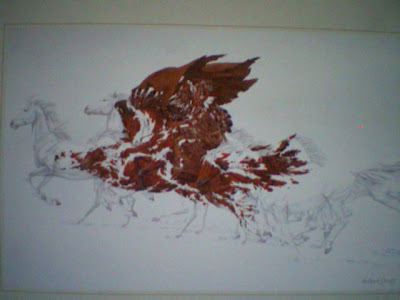 and some of the brown is the rocks and dirt, and some is the horse and still other parts of brown are the indian. SO HERE WE HAVE 3 PICTURES IN BASICLY 2 COLORS: WHITE AND BROWN. 3 PICTURES:1. THE SNOWY GROUND, 2.THE HORSE, &3. THE INDIAN . All 3 are blended together to create an invisible picture. We have an INTERNET T.V. station called "CHALK ART" helpful information on it about 'INVISIBLE PAINTINGS". You can find it at : www.mogulus.com/ chalk_art !!!! 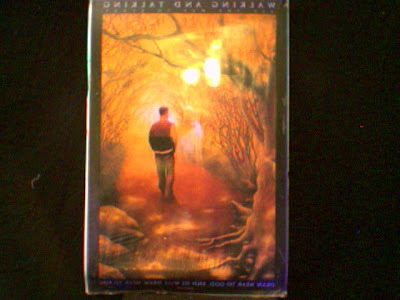 ( You may ask why are you using these mediums ? 1. Because they are large enough to be seen from a distance. 2.They save time and material. 3. They are relatively inexpensive $10 etc. 4. 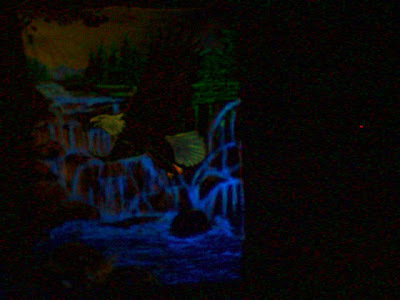 They create a beautiful and dramatic effect with a black light. 5. I am not showing off my art ability.... I use these as dramatic illustrations of what I am speaking on. 6. I can draw on these picture and write on them with florescent chalk (and wash it out) _I can't do that on a painting...if I painted it. IT IS ALL PURELY PRAMATIC: IT'S FAST, CHEAP, INEXPENSIVE, BEAUTIFUL, AND VERY DRAMATIC. 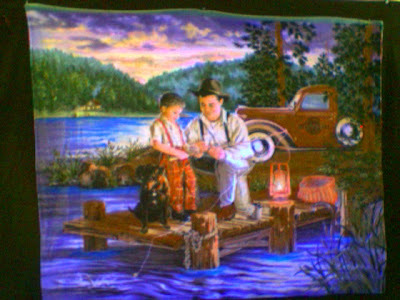 This picture was over painted with:1. florescent crayons (which are invisible on this cloth.2.There is no color florescent blue in the crayons (who knows why?) so I had to use florescent blue paint ( $ 5.00 at the wal-mart craft section--fabric paint ). And I also used some purple in the florescent chalk etc. It is much more dramatic when seen in person. This picture doesn't do it justice. WELCOME TO THE WORLD OF INVISIBLE PAINTING !!! Here we have a 4ft by 6 ft woven afgan throw. 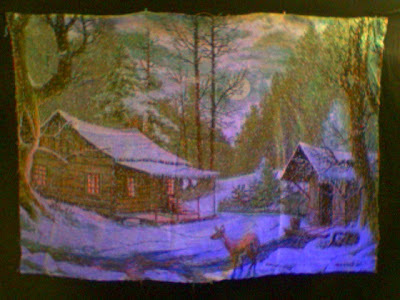 By over painting it with florescent crayons ( which are invisible on this cloth). You get a dramatic change when you turn on the black light and turn off the white light. And I will put some more invisible effects in this picture later. WOW ! WOW ! BEAUTIFUL! IT IS MORE DRAMATIC IN PERSON THAN IN THESE FOTOS. WELCOME TO THE WORLD OF INVISIBLE PAINTING !!! Here we have the camouflage of white :the white is snow, then changes to birds, then changes to rocks, and then back to some more birds. Below, we have leaves laying on a gravel ground. But if you look closer there is a hidden picture ___what is the hidden picture ? 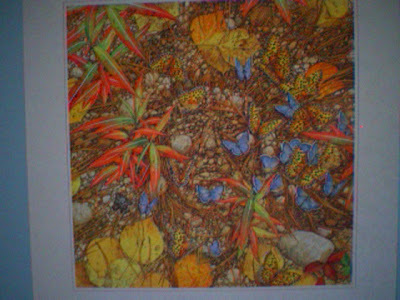 THE HIDDEN PICTURE IS AN INDIAN'S FACE ! Can you see it ? Loook again. WELCOME TO THE WORLD OF INVISIBLE PAINTINGS !! Here we have another INVISIBLE PAINTING from Mexico. 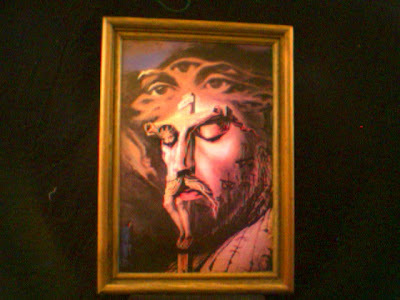 From a distance this looks like a simple painting of Christ. But up close you can see the invisible pictures. Christ beard and hair are actually the women at the cross. 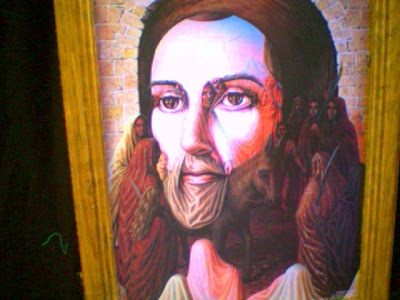 Christ's hair is also really the arch of the door, and their is a donkey in his beard. Actually this is a picture of palm sunday . Christ is ridding the donkey. All in all , this is a very cleaver and well done invisible painting. We now own 25 T.V. stations in 19 diferent languages and we have the experuience to help you launch your own T.V. station. THIS IS A GREAT OPPORTUNITY... LET US HELP YOU GET STATED !!!! WELCOME TO THE WORLD OF INVISIBLE PAINTING !! WHAT DO YOU SEE ? WHAT IS IT THAT YOU DON'T SEE ? 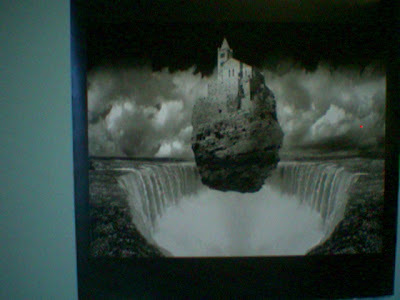 Here we have the seen painting..is actually the invisible picture. 1. At first glance you see an eagle. But there is no eagle !! 2. 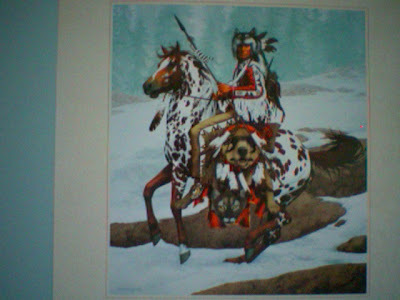 As you look closer you realize that it is a picture of horses AND AN INDIAN. 3. The invisible picture is seen first. And the real picture is then seen second. WECOME TO THE WORLD OF INVISIBLE PAINBTING !!! WELCOME TO THE WORLD OF INVISIBLE PAINTING !!! 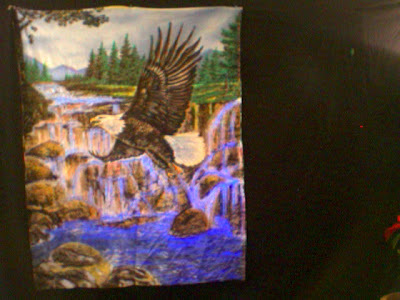 Here we have an AFGAN throw-4ft by 6ft- and it is over painted with florescent crayons and paint. which are invisible in white light. 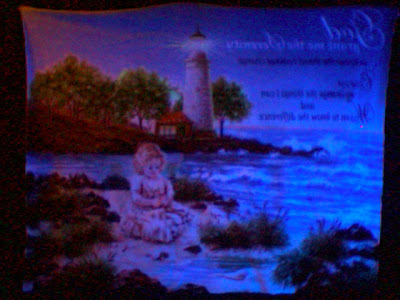 But then when you turn on the black-light and turn off the white light you get the invisible effect. Below you can see the dramatic effect of the ionvisible crayons and paint. WHAT A DRAMATIC 4FT BY 6 FT EFFECT...!!! WELCOME TO THE WORLD OF INVISIBLE PAINTING !!!!!! 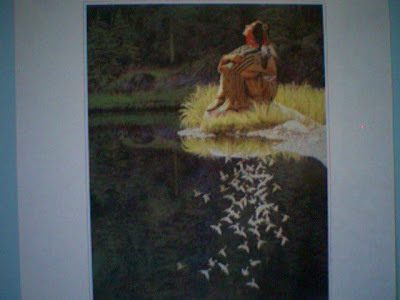 THE REFLECTED INVISIBLE PAINTING -CAMOUFLAGE #4 - What is the girl looking at that is invisible to you ? The answer is in the reflection in the river !! She is looking at the birds flying overhead ! but you can't see the birds they are invisible . But you can see their reflection in the water ! You could also use a mirror, eye glasses etc. to paint or draw an invisible picture !! THE REFLECTED INVISIBLE PAINTING ! !CAMOUFLAGE # 4 What is the indian on the horse looking at that is invisible to you ? He is looking at a hawk flying over head. How do you know ? You can't see it over head- it is invisible to you. You know because of the reflection below in the water. It is kind of like the miss direction they use in magic. Here you are directed to look up to see what the indian is looking at but the right answer is below in the opposite direction.